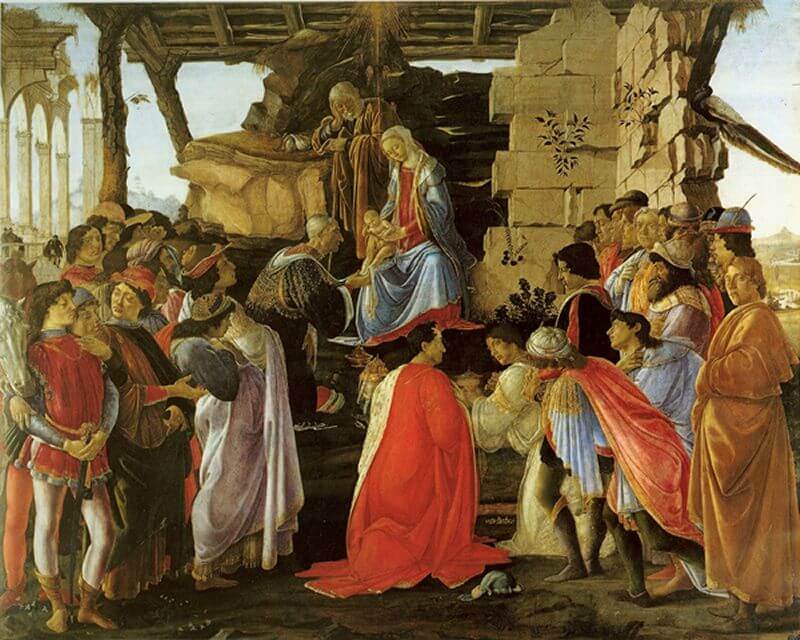 Botticelli wanted to represent the scene of the "Adoration of the Magi" with a frontal view,a great novelty at the time in which people was used to a lateral view of the procession of the Magi. At the center, in a raised position is the nativity hut, under the Magi and the sides all the other characters. The three Magi represent the three ages of life: youth, maturity and old age. The latter is intent to give his gift to the baby Jesus while the other two are waiting for their turn at the foot of the hut. In the figures of the three Magi are portrayed Cosimo de' Medici and his sons Piero and Giovanni. Just behind is Lorenzo de' Medici, and before him his younger brother Giuliano. Although the first three were already dead when the painting was made and the other two do not look like the real characters, Botticelli, with this painting, wanted to pay tribute to the family of his protectors. On the right is also a self-portrait: the character with short blond hair and orange robes. Not far away was represented the purchaser of the painting: the Florentine banker Gaspare del Lama.